Here at Central Texas Collision we are liftgate enthusiasts and we are very EXCITED about the announcement that Maxon made regarding a new feature for their Standard Tuk-A-Way Liftgates 72-150 and TE-20 Series. Maxon announced that these series are new and improved and are now better than ever! 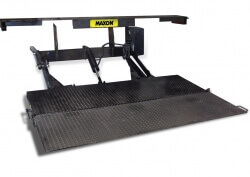 Key Improvements include, lightweight design, new electric control and new direct spring torsion to assist the operator in opening the platform and flip-over area. Now we have seen and repaired numerous liftgates throughout the years, but this one we know will be legendary! ‹ Food truck transformed into mobile boutique!